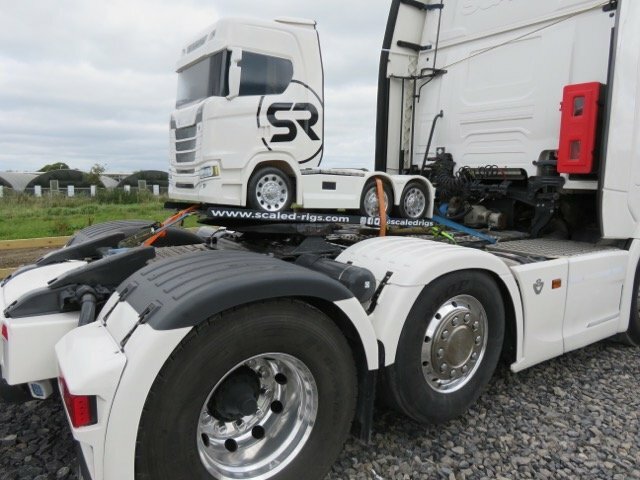 Scaled Rigs sets miniature Scania S730 on its way! From the lines and lines of trucks of all shapes and colours at the inaugural Connacht Truck Show in Claremorris last Sunday, the Scaled Rigs Scania S730 scaled down truck placed on the back of McNamara Logistics tractor-unit wowed the crowd. Design engineer Wayne Auchmuty started Scaled Rigs behind the scenes, spending the past three years developing the prototype. He grew up loving trucks, as his father drove Scanias and always wished there was a ride-on truck as a child. Scaled Rigs ride-on Scania S730 replica truck was created using the most up-to-date technology in 3D CAD modelling, finite element analysis and mould-flow analysis. “The product is a scaled down model of the New Generation Scania S730 that is a ride-on toy, capable of taking children from ages 5 up to adulthood. It is powered by a 24v electric motor with a reliable and robust chain-driven transmission system. The product will is a premium product that is constructed on a stainless steel fabricated chassis with plastic moulded cab and rear section. Fitted with pneumatic tyres it can be used on all surfaces. This product will be a toy that can be passed down through the family for years,” explained Wayne.